Lydia X. Z. Brown is a disability justice advocate, organizer, and writer whose work has largely focused on violence against multiply-marginalized disabled people, especially institutionalization, incarceration, and policing. They have worked to advance transformative change through organizing in the streets, writing legislation, conducting anti-ableism workshops, testifying at regulatory and policy hearings, and disrupting institutional complacency everywhere from the academy to state agencies and the nonprofit-industrial complex. Currently, Lydia is a Justice Catalyst Fellow at the Bazelon Center for Mental Health Law, working on defending and advancing the educational civil rights of Maryland students with psychosocial, intellectual, and developmental disabilities facing various forms of disproportionate discipline, restraint and seclusion, and school pushout. In collaboration with E. Ashkenazy and Morénike Giwa Onaiwu, Lydia is also co-editor and visionary behind All the Weight of Our Dreams, the first-ever anthology of writings and artwork by autistic people of color and otherwise negatively racialized autistic people, published by the Autistic Women & Nonbinary Network. 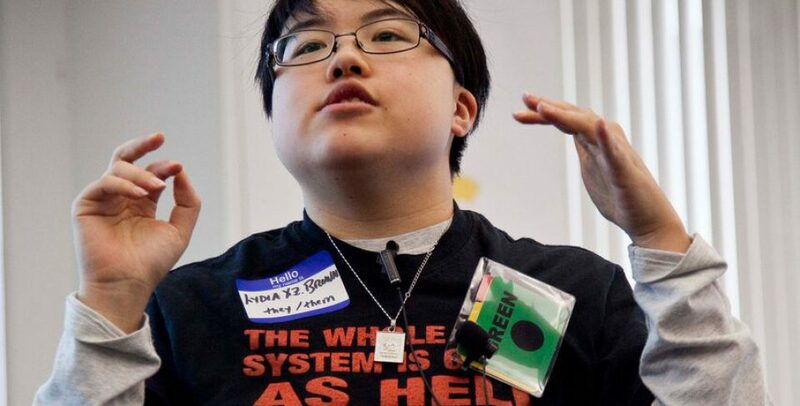 Lydia and Morénike also co-direct the Fund for Community Reparations for Autistic People of Color’s Interdependence, Survival, and Empowerment, which provides direct support, mutual aid, and community reparations to individual autistic people of color. Lydia is also a founding board member of the Alliance for Citizen-Directed Services. Lydia recently completed a term as Chairperson of the Massachusetts Developmental Disabilities Council, serving in that role from 2015 to 2017 as the youngest appointee nationally to chair any state developmental disabilities council. They also designed and taught a course on critical disability theory, public policy, and intersectional social movements as a Visiting Lecturer at Tufts University’s Experimental College. Previously, Lydia served as TASH New England’s co-president and its stakeholder representative to the Massachusetts One Care Implementation Council overseeing health care for people who are dually eligible for Medicaid and Medicare. They were formerly staff at the Autistic Self Advocacy Network for several years, working on programs and policy matters. They have also been a Holley Law Fellow at the National LGBTQ Task Force, and a Patricia Morrissey Disability Policy Fellow at the Institute for Educational Leadership. Lydia has been honored by the White House, Washington Peace Center, National Council on Independent Living, Disability Policy Consortium of Massachusetts, National Association for Law Placement/Public Service Jobs Directory, Society for Disability Studies, and American Association of People with Disabilities. In 2015, Pacific Standard named Lydia a Top 30 Thinker under 30, and Mic named Lydia to its inaugural list of 50 impactful leaders, cultural influencers, and breakthrough innovators. Their work has been featured in scholarly publications including Disability Studies Quarterly; Addressing Ableism: Philosophical Questions via Disability Studies; Religion, Disability, and Interpersonal Violence; Barriers & Belonging: Personal Narratives of Disability; Feminist Perspectives on Orange is the New Black; Torture in Healthcare Settings; and Films for the Feminist Classroom; and community publications including The Asian American Literary Review; All In Your Head Zine: To The Bone; QDA: A Queer Disability Anthology; Criptiques; Disability Intersections; Black Girl Dangerous; hardboiled magazine; POOR Magazine; and NOS Magazine. Lydia recently graduated from Northeastern University School of Law as a Public Interest Law Scholar. While at Northeastern, they served as an active member of the Committee Against Institutional Racism (representing the Asian Pacific American Law Students Association), the Transgender Justice Task Force, and the Faculty Appointments Committee, and are a founding core collective member of the Disability Justice Caucus. Earlier, while at Georgetown University, Lydia co-founded the Washington Metro Disabled Students Collective for intersectional disability justice organizing, led multiple campaigns to reform university policies on disability access that led to creation of a dedicated pool of funding for sign language interpretation and real-time captioning as well as an access coordinator position responsible for public and non-academic programming, single-handedly founded and coordinated the first Lecture and Performance Series on Disability Justice, served two terms as Undersecretary for Disability Affairs with the Georgetown University Students Association, spurred the university to convene a Disability Justice Working Group, provided training to numerous student groups and university departments and offices, and served on the University Center for Excellence in Developmental Disabilities’ consumer advisory council. They have served on advisory boards to a number of research projects, including the National Center for Cultural Competence’s Embedding Cultural Diversity and Cultural and Linguistic Competence: A Guide for UCEDD Curricula and Training Activities Project; a postdoctoral Advanced Rehabilitation and Research Training Program on Health and Functioning of People with Disabilities hosted at Brandeis University’s Lurie Institute for Disability Policy within the Heller School for Social Policy and Management; and Drexel University’s Ethical Autism Research Cultures and Community Engagement project. They have also served as peer reviewer for Journal of Homosexuality, Autism in Adulthood, and Disability Studies Quarterly.